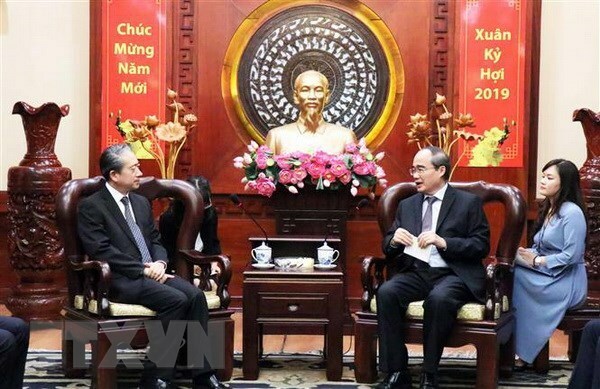 HMC City (VNA) - Politburo member and Secretary of the Ho Chi Minh City Party Committee Nguyen Thien Nhan on January 31 hosted a reception for newly-appointed Chinese Ambassador to Vietnam Xiong Bo. Nhan congratulated China on great achievements the country has obtained after 40 years of reform, especially in economic development and improvement of people’s living conditions. He briefed the guest about HCM City’s development orientations in the coming time, stressing that the city wishes to learn from experiences of developed cities over the world, including those in China, in terms of residential management, transport system organization, water management, housing development, and startup and innovation encouragement. Nhan hoped that Xiong will promote economic cooperation in a practical and effective manner between Vietnam and China, and contribute to enhancing people-to-people exchanges between the two sides. For his part, Xiong highlighted the strong development of the friendship and cooperation between the two countries, saying that the bilateral relationship is increasingly consolidated. The Chinese diplomat stressed that China and HCM City hold great potential to boost cooperation in developing technologies and a high-quality economy, adding that with its dynamic development, HCM City has various opportunities to become a leading locality in applying high and smart technologies in production. He said the Chinese Embassy and Consulate General in HCM City pledge to strictly supervise and remind Chinese enterprises to comply with regulations on environmental protection in Vietnam.